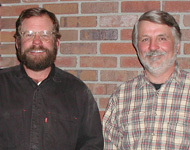 After 20 years of working in traditional construction and engineering, Mike McDowell and Doug Wakefield formed San Juan Timberwrights, a timber frame construction company, which since 1986, has been building artisan-quality timber frames for discriminating homeowners and their contractors and architects. Both have civil engineering degrees, and they bring a special combination of creativity, technical knowledge and hands-on expertise to the timber frame construction business. As craftsmen and engineers, Mike and Doug create extraordinary timber frame homes for clients to enjoy with pride for generations. This year, we are pleased to be celebrating 30 years in the timber frame business. 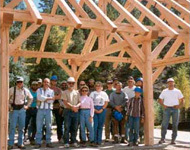 Over the years, our crew has grown into a team of talented craftsmen who design and build several timber frame construction projects per year. 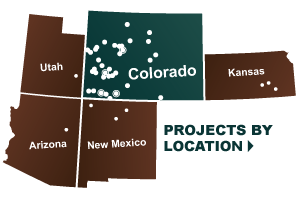 We also have two Colorado locations, in Arboles (near Durango) and in Norwood (near Telluride), that allow us to service clients throughout the Southwest including Aspen and Pagosa Springs. When we work outside of our local area, we partner closely with your general contractor to ensure that the timber frame installation melds smoothly with the rest of your construction. We offer a full-range of services including design and engineering so we can assist with the construction process from start to finish. All of our timber frame construction projects use true mortise-and-tenon joints cut at one of our shops. Our crew delivers and erects them at your site making sure at every stage that your timber frame construction is of the highest quality. We have several types of wood available for projects though we are partial to recycled Douglas fir—it is a beautiful, dry wood that limits shrinkage and puts less demand on the forests. 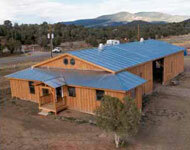 We also offer custom wood packages including cabinets, stairways, trim, flooring and doors.